This Friday and Saturday we had a two day workshop in Contemplative Group Dynamics with Larry Ladden leading it. 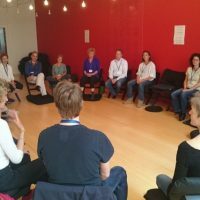 This novel technique for people involved either in meditation or in System Centered Traning is brought to the Netherlands by Annick Nevejan. 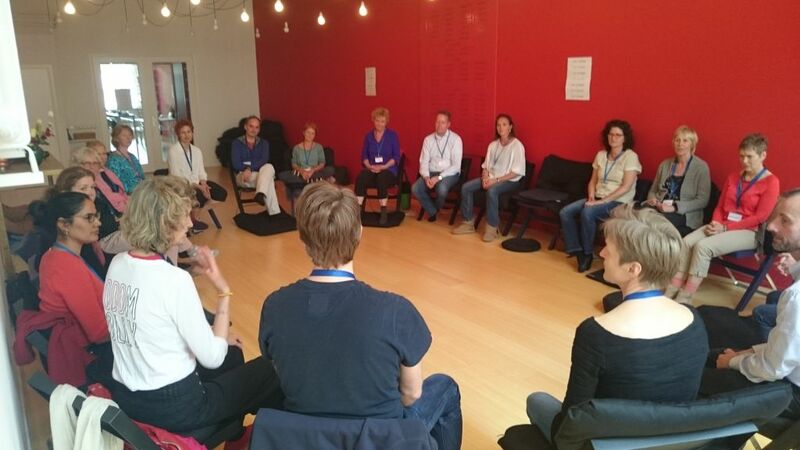 The workshop was organised by Annick together with Tanja Mars and Olaf van Kooten. In total 22 people paricipated of which the majority were teachers of meditation or coaches whit a spiritual inclination. The essence of this workshop was to slow down the mechanism of building up our experience of reality. It was doen by following the four foundations of mindfulness. By alterating the silence with apprehensive speech it becomes possible to directly experience how my mind builds up the experience. This creates a very intimate relationship between the experiencer and the experienced. My experience was that speech and silence originate from the same source and as such the duality between them is suspended. Not only my habitual patterns in thinking and feeling are transformed in the silent sitting, but also the habitual pattern in communication with others are. Although, when eyes are opened and speech is used, the host of extra information thrown at you can overwhelm the practitioner, by taking this very slow it becomes possible to assimilate and study the information flow while it enters our mind. This can dissolve the duality between outside and inside and if courageous enough one can let the personal part evaporate and be fully and intimately in the group. I am very glad this new approach to the four foundations of minfulness has become available for those that are interested in combining social interaction with contemplative discipline. It is an extra possibility that allows me to go further in my meditation and in my social interactions than I have been able to up till now. A real gem in the ocean of spritual and mental disciplines.